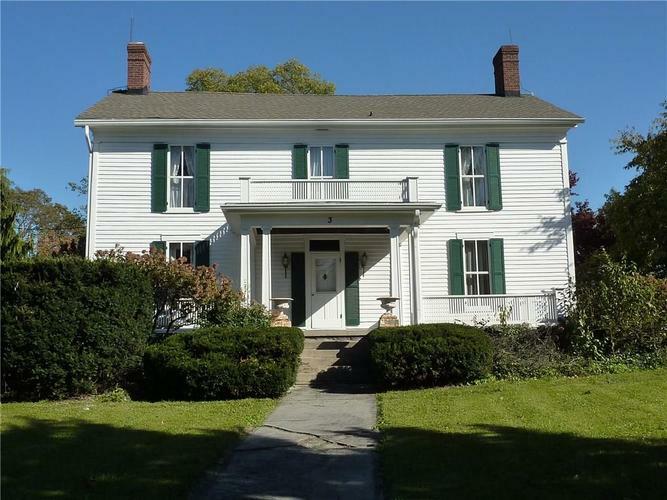 Called the Elisha Braman House and lived in by the 2nd architect of the county Courthouse, this is one of Greencastle's oldest and most historic homes. This Greek Revival 2-story features a large front porch, nearly fully iron fenced back yard, formal gardens, brick walkways, stone patio, & detached 2-car garage with large attached studio. First floor includes formal living room with built-in shelves & fireplace, large formal entry, formal dining room with fireplace, kitchen, family room with fireplace, & half bath. Second floor includes full bath, 4 bedrooms & bonus room with flexible layout for one or more master suites. Full basement w/garage door/walk-out. All appliances incl. Impressive character, antique fixtures & spacious rooms. Directions:From the courthouse square in Greencastle, go east on Washington to the home on the corner of Washington and Bloomington Streets. Enter from Washington Street in the back.